When in a video store, horror movie buffs can make selections based on a wide range of factors such as direction, cinematography, acting, and style. And on some days, some may just want to see the blood fly. 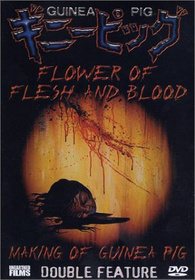 Flower of Flesh and Blood is noteworthy in that it strips the traditional splatter formula down to the bare minimum. It does not burden itself with things like plot or characters. It is simply a filmed record of an extremely graphic murder, and the intensity that results in watching it can be compared to drinking a triple shot of Everclear. It burns going down, gives you the shakes when it hits, and leaves you feeling dazed and nauseous. In a nutshell, a young Japanese woman is abducted by an unidentified assailant. She wakes in a blood-splattered room, tied to a bed, and the assailant presents himself to her dressed as a Samurai warrior. He injects her with a powerful narcotic, ensures that she is unconscious and unreceptive to pain, then proceeds to slowly and methodically dismember her with a variety of tools. As the title indicates, this man finds beauty in death, and his demeanor during the mutilation is that of an artist carving figures from stone. I found Flower of Flesh and Blood to be disturbing and sadistic. Yet I would recommend this film, mainly because it doesn't pretend to be anything other than what it is. If you are looking for gore, it will deliver. With interest. I should add, however, that there is no campy quality that some other splatter films employ to soften the psychological impact of the violence. And being a fan of special makeup effects for over twenty years, I can say that the quality of these are exceptionally good. This is not a "fun" movie to watch, and its images may linger in your mind for a longer period of time than you'd prefer. Submitted by Jim Hammond (not verified) on Mon, 2009-11-09 20:49. Gee, I'm glad you watched this one for me. Thanks for the warning and all that. Nicely done review, however. 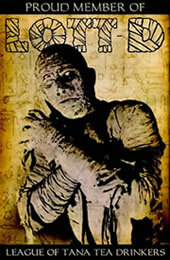 So how long did those images linger?